Every muscle group in the body connects to another muscle group by virtue of location and tendon placement. They all work together to form a unique network of muscles, unified in the single purpose of completing tasks we ask of it. When we attempt a simple lift, such as the bench press for example, hundreds of small muscle groups and thousands of fibers are called into play. The simple act of benching 135 pounds for a single rep requires contributions (in terms of contraction and the exertion of force) from the pectorals, three heads of the deltoids, triceps, forearms, and back muscles to a lesser extent. Additionally, we may even exert some force all the way down to our calves as we use our entire body to help move the weight, as is the case in some circumstances. In light of this, it may seem odd that bodybuilders work so hard to isolate their muscle groups when training. Perhaps by training them together, synergy can be achieved in both terms of controlling and mastering the weight, efficiently using time and training energy, and capitalizing on optimum blood flow. Here is a workout which works to achieve these goals while allowing the trainer to hit his or her triceps and shoulders fully on the same training day. Train heavy with the first movement, and moderately with the triceps presses. 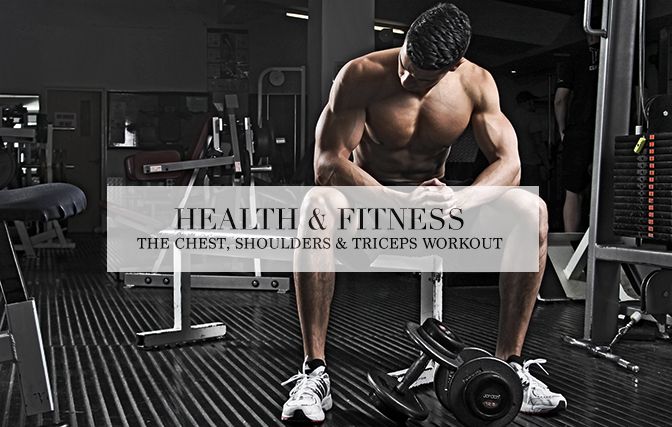 This time, train moderately for the shoulder set, then go very heavy with the skull crushers. The weight used on the dumbbell side raises should be moderate to allow the feel to be greatest in the rear deltoids. Bench dips should be limited to two 45-pound plates on the lap. Keep the weight light for both movements to avoid injury. The influx of blood into the combined shoulder/triceps region will deliver a greater pump than would a workout designed to only affect one of these muscle groups. A larger surface are will have more combined strength, exert more combined force requiring the recruitment of more muscle fibers, thereby drawing in most blood. This delivers greater nitrogen to the area by virtue of increase amino acids. Additionally, the trainer employing a shoulder/triceps training combination may see increased separation in that shoulder/deltoid area. Many bodybuilders have great shoulders, and many have great sets of triceps – but it is very rare that you see a bodybuilder with the shoulder/triceps separation of a Samir Bannout or a Shawn Ray. Train them together, and you may see a huge change! This entry was posted in Training and tagged Shoulder Exercises, Shoulder Training, Shoulder Workout, Triceps Training, Triceps Workout. Bookmark the permalink.